An HFE editorial theme for March is passive components. DC blocks, for example, generally require inductors and capacitors in their makeup. An interesting related story1 and associated technical paper2 reveal an emerging technology which, although not obscure news, may not be well disseminated. A portion of this information comes courtesy of the European Passive Components Institute (EPCI) and the University of West Bohemia (UWB). 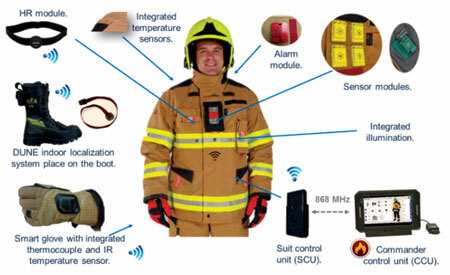 It describes the rapid development of smart textiles applied to “first responder” suits. The subject is the quickly developing field of wearable electronics. Wearable technology, particularly smart textiles, is exploding in popularity in both the research and consumer spaces, resulting in a lot of developments and innovations. This is due to the increasing demand for wearable electronics from industries such as medical, healthcare, sport, fashion, entertainment, military and protection. In smart textiles, interaction with the surrounding environment or the user is often prerequisite to the use of sensors and functional textiles, which usually have need for electrically conductive properties. Such textiles are also referred to as e-textiles. However, most of the present electronic sensors that detect and transmit data from wearables are made of hard, inflexible materials that can restrict both the wearer’s natural movements and the accuracy of the data collected. Consumers and manufacturers generally approach smart textiles with caution. This is partly because they contain fragile or brittle metal-based materials, which can lead to lower efficiency or even failure. The trend is to progressively integrate electrical components into textile structures at the polymer and fiber level instead of using textiles only as a substrate for attaching sensors, antenna structures, plugs/receptacles, audio devices, output devices, and printed circuit boards. Seamless integration of other conductive novel materials, such as graphene, carbon nanotubes (CNTs), and silver nanotubes are slowly emerging. Much work is being done with commercial manufacturers of conductive textiles, including metalized textiles, conductive polymeric textiles, conductive inks and adhesives. Intuitively one can conclude that durable outerwear (not subject to constant abrasive washing, drying and exposed outward to open space) would be ideal for things such as antennas, particularly of the microwave or millimeter-wave type due to small size. Integration of components and even systems directly on or into textile “substrates” is enabled by integration of passive components by methods such as embroidery. Conductive or perhaps in some cases, resistive threads that have controlled, measurable end values can be employed. A key to success is understanding how this circuitry behaves at high frequencies. Figure 1. PPE with Passive and Active Controls. Courtesy of EPCI, depicts some of the beneficial attributes of the wearables on PPE. Elements of these systems are passive electronic parts that need to be simple (e.g. planar), small, light, flexible features created by embroidery/knitting (a term that generally does not have relevance to electronics). Electrically conductive threads are employed creating conductive patterns on textile substrates. This thread medium is usually less conductive than bulk copper. However, it is sufficient, particularly for higher frequencies where skin effect depth has influence. The researchers at UWB, working with others in the region, manufactured and tested various passive components comparing printed circuit board circuits (conventional circuits for baseline performance), screen printing, and embroidery. One example of a conductive thread embroidery makeup consists of polyester fibers spun with eight brass wires. Reported brass content of the thread is approximately 70%. A square spiral inductor embroidery example (Figure 2) with a conductive pattern filled with multiple conductive threads is shown with higher clarity in Figure 3. Figure 2. 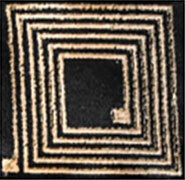 Embroidered Conductive Spiral Square Inductor of Fabric Substrate. Figure 3, Closeup of Filled Embroidery Thread Conductive Pattern. Similarly, interdigital capacitors were developed. See Figure 4. This figure illustrates how various samples were constructed, first being silver paste screen printing on polyethylene terephthalate (PET) foil, next embroidered on textile substrate and on textile with one conductive thread. Figure 4. Various Conductive Circuits on Fabric. The details of the UWB electrical findings will not be discussed here, however VHF embroidered square-shaped spiral inductors had lower self resonance (60 MHz) than that of the conventional PCB inductor with similar dimensions (95 MHz). Meander inductors, embroidered and on PCB had lower resonances than screen printed versions. The self-resonance frequencies of interdigital capacitors were quite lower on embroidered (80 MHz), compared to 150 MHz for those on PCB, 170 MHz for single thread, and 250 MHz for screen printed. Increased edge coupling due to thickness associated with the embroidered circuitry may be a factor in lower frequency resonance. 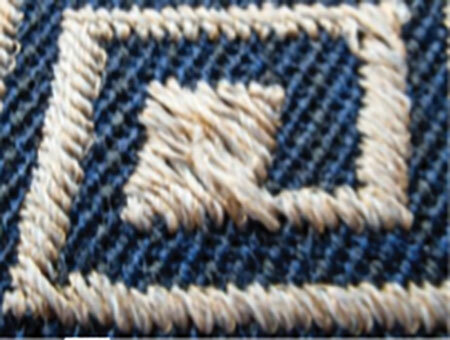 It was noted that the impedance varied significantly between embroidered and single thread embroidered (better). Single thread may, however, suffer from reliability problems since if the single thread breaks the circuit topology is likely significantly altered. The multiple conductor embroidery would more likely have minimal degradation with single thread breakage, unravelling, or dislocation. •Wujiang City Yuzhen Textile Co. Ltd. The self-resonance frequency for screen printed components is higher than for embroidered components. The self-resonance frequencies for embroidered components are similar to components created on printed circuit boards. Electrical parameters of embroidered components with only one thread are generally better than electrical parameters of components created by embroidery of full conductive pattern. Measured difference in self-resonance frequency values are very important for the design of embroidered and screen printed planar electronics components and systems. Obviously as these systems become widespread and demonstrate high value, portions will find their way into everyday civilian activity. One many of us might relate to…. Imagine a symposium where the guest gift is apparel with built in RFID and software with directions or even sensors that can guide the attendee to selected papers, vendor exhibits, hotels, restaurants, transportation etc. Tom Perkins is HFE’s Senior Technical Editor.